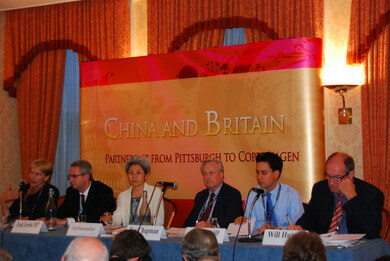 On 29 September, Ambassador Fu Ying chaired the China Forum on the sidelines of the annual conference of the Labour Party. Attendants included Secretary of State for Energy and Climate Change Ed Miliband, Minister of State for Foreign and Commonwealth Affairs Ivan Lewis, other senior governmental officials and academic representatives. Fu Ying illustrated on China’s achievements in the past 60 years and answered questions from the floor. Fu Ying said, the People’s Republic will be celebrating its 60th birthday in another two days. A grand ceremony will be staged in Beijing. The Chinese people, full of pride, will demonstrate to the world what they have achieved. Fu gave a vivid depiction of the tremendous improvements in people’s livelihood based on her own story. She also said that along with China’s economic success came unprecedented improvements in human rights and fundamental freedom. Fu Ying said Prime Minister Brown had sent his video congratulations on the 60th anniversary of the New China and expressed that China’s continuous prosperity, stability and success is in the interest of UK. Bilateral relationship is in its best-ever historical period. China speaks highly of the commitment, input and contribution made by the Labour Party government and Prime Minister Brown himself. China is also ready to work closely with the UK and make greater contribution to resolving global issues such as the financial crisis and climate change. 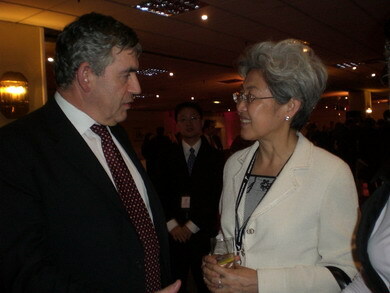 Fu Ying said, this is my third time at the annual conference of the labour party. I remember when I was first here in 2007, people were talking about China in almost all the workshops. 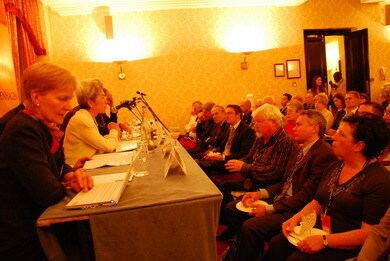 There was a keen interest among members of the Labour Party. That was how I decided to organize the China Forum on the sidelines of the meeting. As the Forum takes place for the second time, I hope that direct communication with grassroots members of the Party can help us convey messages of China and result in thorough dialogue on issues of joint interest. This will give our friends here a more genuine picture of China. Differences are not invisible between our two countries. What matters more, however, is to properly resolve differences through dialogue. Fu Ying also illustrated China’s response to climate change and all other challenges it faces. Attendants extended their congratulations on the 60th anniversary of the founding of the New China. MP Milliband, Secretary of State for Energy and Climate Change, said that China had embarked on the world stage and is playing a major role in resolving global issues. He said, President Hu Jintao’s statement on climate change at the UN is significant and ambitious. He is convinced that China will make greater contribution to the Copenhagen climate talk and the two countries will work together to increase the likelihood of a successful meeting. Minister Lewis said that China had scored impressive achievements on economic development and poverty reduction in the past 60 years. Measured by whatever standard, its success is to be adored by the outside world. Differences between our two countries are there. But they will not be allowed to destroy our efforts of enhancing bilateral relations. A new type of bilateral relationship and strategic dialogue between China and the UK will help the world respond to major challenges. Lewis also reflected on his trip to Tibet as part of his recent visit to China. Fu Ying answered questions on climate change and China’s human rights record and briefed the audience on the development and progress in Tibet. The one-hour forum was soon over. But many were still lingering around and raising questions to her. On the sidelines of the annual conference, Ambassador Fu Ying attended the international reception and exchanged views with senior officials such as Prime Minister Brown and Foreign Secretary Miliband on the development of bilateral relations.